Published: March 29, 2015 • Modified: October 31, 2018 • by Author: Analida • Word count:869 words. • About 5 minutes to read this article. 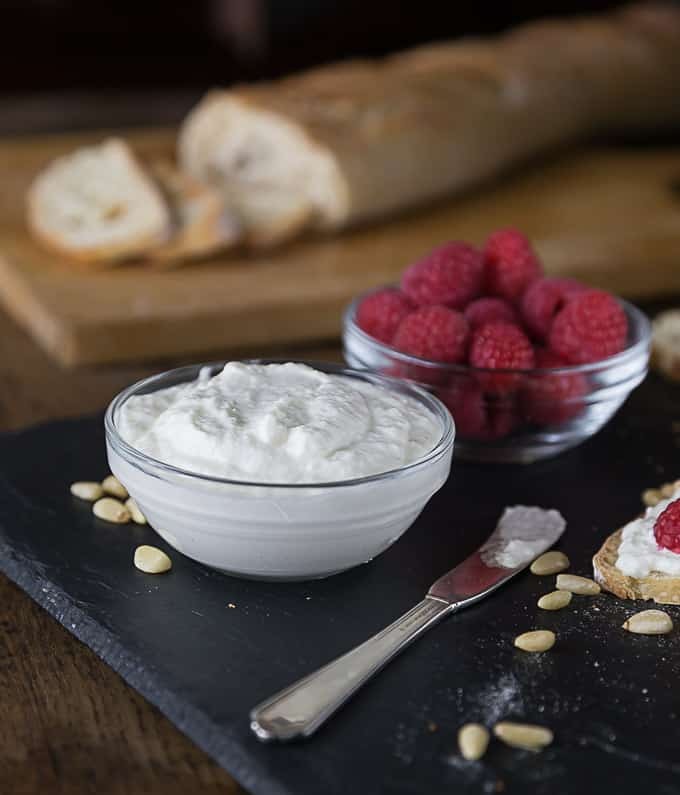 Goat Cheese or chevre, no matter what you call it; is go-o-o-o-o-o-d! Sorry, I couldn’t resist. It’s unbelievably easy to make, not to mention inexpensive compared to the cost of a store-bought portion. Seriously, it’s about half the cost. If you’ve ever wanted to learn how to make goat cheese, you’ve come to the right place. By the way, you don’t need a goat, or even a friend with a goat. My local Wegmans store carries goat milk in their organic food section. I was fortunate enough once to have had access to fresh goat milk. My daughter had a college friend whose family had a farm with goats. She graciously gave me a gallon. Aahhh, that was fabulous! Goat cheese is made by a process known as acid/heat coagulation. It is the oldest method of cheese making in the world. Lemon juice and vinegar break apart the protein structure of the milk once it has reached a certain temperature. The most specialized equipment you will need is a digital thermometer. Goat cheese and goat milk production date back to around the 5th millennium when goat herding was increasing along the plains of the Euphrates river. Goats were a mobile food supply which made pastoralism easier for shepherds and herders. As a result, milk production increased during this time and consequently cheese-making too. Goat cheese makes an appearance in Greek mythology. In Homer’s epic tale The Odyssey the Cyclops Polyphemus is found molding goat cheese into rush molds. There is also evidence of cheese-making from drawings found in Egyptians tombs. By the time of the Roman Empire cheese-making was already an established art. When making goat cheese you need to be aware of the fact that the curds and whey will not separate in the same manner as they do with whole milk. The texture of goat cheese will not contain the larger curds like ricotta. Yes, the recipe for ricotta will be forthcoming soon. In order to improve the separation I use two types of acids: lemon juice and vinegar. You should make sure that you have a double or triple layer of fine cheese cloth so the tiny solids don’t go through. I like to add herbs to my goat cheese. My choice is tarragon, because of its sweet taste. I think it adds a nice contrast the slightly acidic taste of the goat cheese. I am actually very proud to say that I recently taught a French student and friend, Hélène how to make goat cheese. 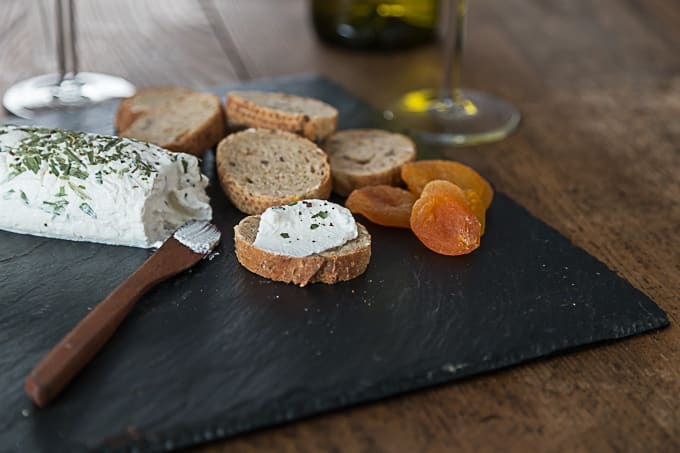 Goat cheese or chèvre as it is known in France is her favorite cheese. She was amazed. “I am going to teach my dad.” she said. She started to rattle off all the wonderful dishes one can make with goat cheese including a tomato tart with goat cheese and basil that sounds positively fabulous. Yes, I will extract the recipe from her and post it. Hélène also likes to drizzle honey over her goat cheese. She advises the use of a honey without a distinctive flavor. I haven’t tried this yet, but you can bet the goat farm I will! The steps to make this are pretty easy. Making your own ricotta cheese is a simple recipe and very versatile to use in lasagna or making ricotta gnocchi. Lebanese cheese fatayer is a popular cheese filled bread and comes together quickly. 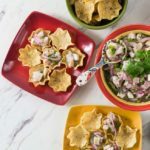 From Latin American you can make homemade queso fresco which is a popular topping for tacos and enchiladas. 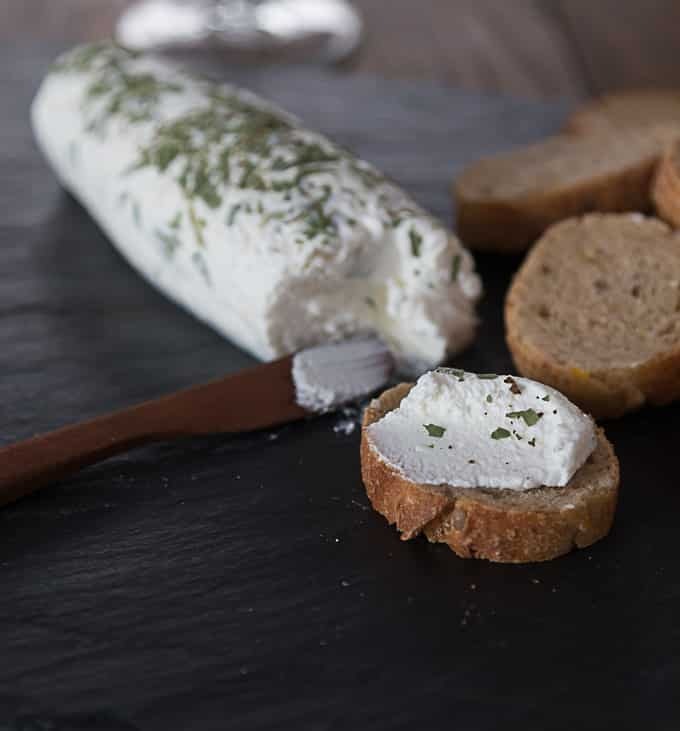 Here is a recipe to make goat cheese at home with a few simple steps! Goat milk has been available in my local grocery store for some time and this cheese is so easy to make. In a heavy bottom sauce pan heat the goat milk until it reaches 180'F. Stir frequently to ensure even heat throughout. Remove from heat immediately; add the lemon juice, and stir a couple of times until combined. Add the vinegar, stir briefly until combined and allow it to sit for about 30 minutes. The curds will not be large, on the contrary they will be like tiny specks. Slowly ladle into the cheesecloth. Add the salt and stir lightly. Gather the ends of the cheesecloth, and tie them with kitchen string. Tie to your faucet. Allow it to hang and drip for about 1 hour. Place on a cutting board and shape. Sprinkle with died herbs of your choice. Refrigerate and serve when set. If you want to venture further down the road of cheese making here are some kits you can order on Amazon. (affiliate links below) These are very reasonable and I will get paid a small commission if you order them to help me maintain my site. I never thought to make my own goats cheese before. What a fantastic idea – thanks for the inspiration! Thanks Thalia. It is so easy!!!!! My next culinary endeavor is learning how to make feta. BTW… I always admire your baked goods. They are so beautiful and look so yummy!!! I’m trying this recipe. What do you do with the salt? Matt! so sorry I did not include that. I add in the salt once I have placed the heated goat milk in the cheesecloth. Please update the instructions for adding the salt. Hi Karen, the salt is added after the cheese is poured into the cheesecloth. I’ve used this recipe three times, the first time was perfect, but the last two times my cheeks came out really dry and crumbly. The first time I drained it for an hour, the second time only 30. What might I be doing wrong? Hi Linda. Sorry you had issues with the goat cheese the second and third time. I don’t think you are doing anything wrong. What I would probably do next time is check it a few times while it is dripping. You can touch the dripping cheesecloth to gauge for moisture. I am puzzled, since I have not had this happen to me. Can I ask what kind of goat milk you are using? Analida – same thing happened to me last night. The cheese came out dry and crumbly. I used fresh milk that came straight from my neighbor’s goat. I made mozzarella last night as well from whole, pasteurized but not UP milk and it too came out a bit dry. Wonder what I’m doing wrong.. It’s really delicious, especially with the basil I added from my garden but just not the texture I was hoping for. Cher, I can’t imagine what you are doing wrong. One thought is temperature. The mozzarella should not go above 90’F and the goat cheese should not exceed 180’F. Another thought is the acid used to coagulate the milk. The size of the lemons can influence the amount of lemon juice added which can affect the texture.Other than that I really cannot think of anything. I am so sorry you are having such trouble. Hi all- I want to try this soon- white vinegar or cider vinegar is best to use? Penny, I have not used cider vinegar to make goat cheese, just the regular vinegar. What kids of salt do you use? Hannah, I use Kosher salt. I love goat cheese and love it with honey too. Hi there! I found you on Motivational Mondays…all I can say is Thank YOU! I LOVE goat cheese. It’s my favorite appetizer…who needs dinner or dessert afterwards 😉 !! I prefer to eat it as part of a meal, not the meal itself. Variety! 🙂 yes variety is great! One of the local restaurants here has an awesome goat cheese salad. 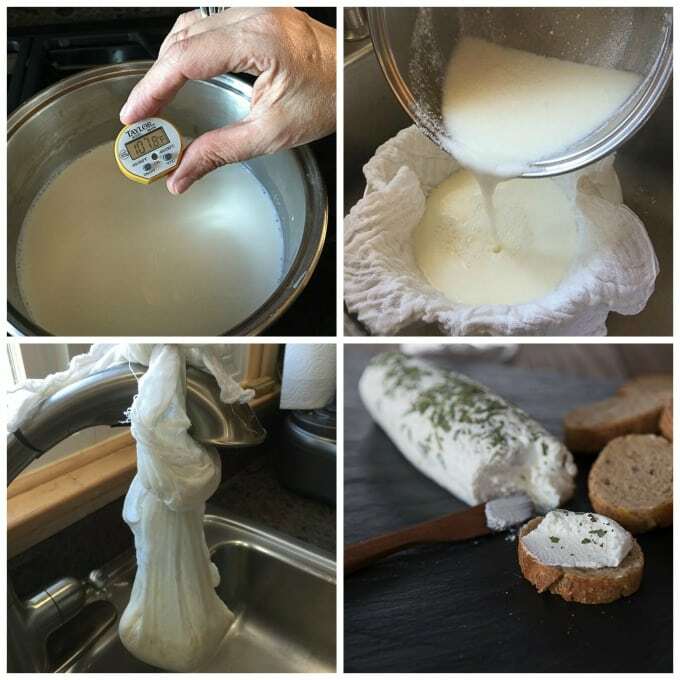 Loved this post, and I can’t wait to see how to make queso fresco too, one of my favorite cheeses. Cyrus, please do. It is so easy. If you have access to fresh goat milk, even better. Rachel, it is fun to make. If you can purchase the cheesecloth in bulk you will save a lot of money. Thalia – Duh!! (As my kids would say.) I’ve been making homemade ricotta with cow’s milk and never thought to do the same and make my own goat cheese. Can’t wait to try it. I make ricotta too. It is so yummy. I also make queso fresco (fresh cheese). It’s like a farmer’s cheese. I put it on my toast in the morning. Goat cheese is my favorite cheese. There is a great local place near me called Harley Farms that makes the most amazing goat cheese! I love to stop by and pick it up fresh. Cool, now you can make it. Are you able to get fresh goat milk? Pasteurized milk doesn’t curdle the same way as fresh, but it will usually curdle at least a bit. Hi I am reading Carol’s comments of Dec 4/2015 about the making of goat cheese and the problem that you are having and compares with Cow Milk, I am having the same problem Now ,using the same amount of vinagr as for the Cow Milk and the same temperature ,final result ,No curds is forming. Hi! I am so sorry you are having trouble with curds forming. You could try this: heat to 175’F maintain that temperature for about 10 minutes. Add the vinegar, and stir until curds begin to form. Remove from heat and allow it to sit for about 10 minutes. Curds should form. I truly hope this works for you. Hello! This is great…and tasty! We use to do cheese at home from usual cow milk but I need to try this one too. I will feature this post on Bloggers Brags Pinterest Party. Visit my website starting Monday to share the good news! Thanks so much for featuring our post. This looks sooo easy. Now I can’t wait to try it. Pinned and stumbled! Very easy recipe! And so nicely laid out with your photographs of the steps…Thank you! We just got our little milk goats…Can’t wait for FULL production. Have you tried goat yogurt? No I haven’t tried goat milk yogurt. I will look for it in my grocery store. I made this cheese today and probably let it hang too long because it was a bit crumbly but still delicious. Maybe I missed it but the recipe doesn’t tell us when to add the salt. I threw it in after heating and before lemon juice. Thanks for the recipe! Melissa, I usually add the salt right before I hang it. Sorry it didn’t turn out the way it was supposed to. however I am glad that it tasted good. Beverly, I am so sorry it did not turn out spreadable. I have never had any problems. Next time, let the milk sit a little longer after you add the vinegar, perhaps 10 minutes. I will make a change in the recipe. Thanks for letting me know. I am glad you enjoyed it anyhow. This sounds so temptingly easy to make! I can’t wait! A local place I know makes delicious pineapple chevre but it’s about half a day’s travel away from where I’m staying now so it’s become a bit of a luxury. I just have a few questions though: on step 3 – 4, should the milk be cooled down to a certain temp before I add in the lemon juice? and on step 5 – 6, what would happen if I let it sit for longer than 2 minutes before pouring out into the cheesecloth? You do not have to cool the milk to add the lemon. As for waiting longer than 2 minutes, I really don’t know if anything would happen. I did it this way and it worked out for me. Nevertheless, you have given me some “food for thought” for lack of a better phrase. Perhaps I need to revise my recipe instructions. I’ve never heard of pineapple chevre, it sounds delicious. Can’t wait to try this & see if I can duplicate my favorite chèvre from a goat farm in NY (that we bought at a Farmers’ Market by the Museum of Natural History on Columbus Ave in NYC one Sunday in September) — Lavender & Honey Chèvre. It was heavenly! Wow! lavender and honey chevre sound amazing. I might need to try making that next! 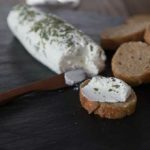 This goat cheese recipe is the best! I used Meyenberg Ultra Pasteurized Goat Milk and it turned out perfect. I also let my goat cheese drain overnight! Better than store bought goat cheese! One thing I’d also like to add, is I rinsed the cheese gently with cold water before I hung it to drain to wash out the tangy vinegar taste. I used raw apple cider vinegar. I tried this today, and it did not work. I used Meyenberg low fat goats milk. I also had trouble heating up the milk, my thermometer had erratic readings, when the milk started to boil is when I decided enough was enough, and took it off the heat and added the acids. I looked around for other recipes and they all include rennet, and a purchased culture packet. I liked this recipe as I did not need to purchase anything extra, just use what I had at home already. I am going to try again with whole goat milk. Jennifer, sorry you had trouble. A couple of things stick out: do not use low fat goat milk, it will not work. Also, I would get a digital thermometer since they are very accurate. You do not want to let the milk go above 180’F. When you boiled the milk, it caused the proteins to break down. Do no use rennet, it is normally used for mozzarella. If you use the whole fat goat milk and get a new thermometer, I am sure it will work. Thanks for the response Analida. I will try it again. you are welcome Jennifer. I hope it turns out. I’ve never had a problem. This recipe doesn’t work. Full fat goat’s milk won’t set correctly at 180°F with lemon juice and vinegar. You need a chevre culture to make this happen…. well worth the extra $4. I’ve made this recipe numerous times and it always works. Jive made this recipe several times. It has worked every time. Great & easy recipe! Glad to hear it has always worked for you. Yes! I once made it from fresh goat milk. My daughter used to know a girl who had a goat farm. it turned out great!!! Just found your recipe today after I had been to store and noticed the addition of goats milk. Next trip to town I will have what I need. Am anxious to try this. I am all for everything “farmy”. I made the yogurt and incubated it for 9 hours. It was quite runny. I made it again and incubated it for about 15 hours. The texture turned out great. But the yogurt is strong. Almost a soured flavor. I like the taste of the first batch and the texture of the second. Any suggestions for me? Will the second batch harm us since it was left longer? Meaning is it safe to eat? Cindy. I have never made this recipe this way. It is not a yogurt, so it is not supposed to sit out for longer than an hour or so while it drips. Whenever I make it I always place it in the refrigerator as soon as it is done dripping. I would definitely not eat if it has incubated for 15 hours. I must try this, goat cheese is one of my favorite things! do try it out and let me know how it turns out! Hi there. Thanks for recipe. I noticed one reader said theirs came out crumbly and not spreadable. I eat chevre in the UK and it’s always crumbly and creamy but very firm with a rind and definitely no spreadable – perhaps that’s not how it should be but I prefer goats cheese when it’s more like this. Do you know how I’d adapt the recipe for this kind of result? Thanks! Louise, frankly I don’t know. I’ve always made it so it turns out to be spreadable. Perhaps there are some websites out there that might explain how to obtain the results you want. The rind I am afraid is part of the aging process, and you might need more sophisticated processes than can be performed at home. Can this be stored in the freezer and for how long? Thanks. Janet, I have never stored it in the freeze. I think it would change the texture, so I probably would not. Fresh goat cheese can be frozen so long as you do not add the salt or herbs. Dot, thanks for your input. I’ve actually never frozen it since we eat it rather quickly, but it’s good to know that it can frozen. How can this date backn to the fifth millennium when we are smack dab at the beginning of the second millennium? It’s all in the wording, and yours was a good catch. What I meant to say was that it dates back to about 5,000 years. However, we are at the beginning of the third millennium. What does this recipe yield? Matt, I would have to say about 6-8 ounces of cheese. What type of vinegar do you use for this recipe? Danielle, I use the regular white vinegar. Hello! Can you add the herbs in when you mis in the salt so that they will be evenly distributed throughout the cheese? Sure! I like to add some dried herbs also! Thank you for the recipe. I have two milking goats at the moment so am making cheese quite regulalry. The first time I used your recipe, the cheese ended up rubbery like mozzarella. Since then though it has been more powedery, like cottage cheese. Unfortunately I cannot identify what I’m doing differently. Might you hve any suggestions so I can get back to the mozzarella type consistency again. Hi, be sure you get the temp to 180f or 82c. If you like a firmer curd you may want to experiment and add some rennet which will give you a firmer curd like mozzarella. Thanks for the recipe! When I make it my cheese tastes lemony.. I use bottled lemon juice. I use 4 tbsp per batch. Is this too much? Hi Krista, I always use fresh lemon juice and it’s about 1/4 cup. I always let it drip for at least 1 hour and I check it periodically to see how soft and moist it is by giving it a slight squeeze. Let me know how this works. Can you still make goat cheese after separating the cream for butter? Also, what breed of goat do you believe produces the best tasting cheese? Is there a reason you use dried herbs and not fresh herbs? And how long will this cheese recipe stay fresh in the fridge? Hi Carole, I don’t know if you can make goat cheese after separating the cream for butter. I have not tried this before. As regards to what goat produces the best cheese… I don’t really know, since I am not well versed on the various breeds of goats out there. I have heard a lot has to do with their diet. Hello! Great recipe! Do you use pasteurized goats milk or unpasteurized?thx a bunch! Hi there! I have used both. Once I was lucky to get fresh goat milk. My daughter had a friend from college whose family had a goat farm. Alas, that was the only time! Since then I have used pasteurized goat milk from the grocery store; it works well. Hi Leona! I have never made goat cheese this way. I would probably google it. I am sure you can find some instructions. It sounds like a very interesting way to make goat cheese. I was actually thinking about buying some kefir at the store. I am sorry I could not be of more help. I My store did not have goat milk so I tried buttermilk. It turned out great. Can you double this recipe? I’ve made mozzarella cheese many times as well as other cheeses. It will be odd not to use rennet but I’m going to try the recipe as written. Can you tell me how it would change if I were to add the chevre culture? Does the recipe change? Hi Carol! Thanks for reaching out. I am pretty sure that you can double the recipe. I have never used chevre culture, but have seen it used in other recipes. Sorry, this is not an answer per se. I am curious, what other cheeses have you made? Hi, can I use fresh cow milk instead of goat milk? I don’t have goat milk available here. Hi Ash, you can probably use cow’s milk, but the taste will be different. You might want to do a little research first. My guess is that you will end up with more of a ricotta cheese taste. Hope this helps. When you make this, how long does the milk usually take to get up to 180°f? I made this today and mine also came out really crumbly. Which is okay, I put it in a spaghetti squash meal which it is perfect for, but it would be nice to be able to get it more how you have yours pictured. Mine isn’t spreadable at all. Hi Johanna! Sorry yours turned out crumbly. I have a suggestion. You can try saving a tablespoon or so of the goat milk, to stir it in if you end up with a crumbly texture. Another option is to allow the curds to set for a longer period of time before you run them through the cheese cloth. My recipe calls for 10 minutes of set time. Perhaps try 20 next time. Hope these suggestions help. You are welcome! I don’t think it has to do with how long it takes to heat up. I know this is a silly question, but did you use a thermometer? How long did it take for it to get to that temperature? I did use a thermometer. I didn’t keep track of exactly how long, but I’d say somewhere near an hour. I did have it on a fairly low heat because I didn’t want the milk to burn. It hovered around 160°f for a while. Johanna, try to let the milk heat up to 180’F next time. Also perhaps you want to turn up the heat to medium. All the while the milk up I was right there stirring, so the milk would not burn. Also if you are using an electric stove, make sure you completely remove the pan from the heat once it reaches temperature. I did all of these except the medium heat. Mine did eventually reach 180. I will try a higher stove temp as well as letting it set longer. Thanks! I’m glad to know I’m not the only person having trouble with the goat cheese consistency. I followed your recipe to the letter using goat milk straight from the goat and after draining it had the consistency of sand. Totally unusable. I am so sorry it did not turn for you. I don’t know what could have gone wrong. I have made it several times without incident. The first time around I was fortunate to have fresh goat milk from my daughter’s friend’s farm. Again, I am so sorry. Greetings! Just tried this with great success. Only had low-fat goat milk, but couldn’t wait, so mixed half goat milk and half and half (assuming the fat content was important). Not as tart as all goat milk would be, but mild flavor and creamy consistency. Thanks Analida and all who took the time to add their comments. Kaaren, I am so glad it turned out well. Yes, fat content is important indeed. I have never thought of using half and half in the recipe, but now I will!!! Thank you for taking the time to comment. What do you put it in after the cheesecloth? Krystel, you can put it in a glass or ceramic bowl. Ok, it just finished and when I took it out of the cheesecloth it was like ricotta. Maybe it will change once refrigerated? I just got two dairy goats, so I’m excited to try new recipes! Thanks for responding! Hi Krystel! A ricotta consistency is fine. Wow, two dairy goats!!! That is so cool! Let me know what other recipes you make with goat milk/cheese. I am curious if this would work with store bought, ultra pasteurized goat milk.. I have made ricotta and yogurt from store bought cow’s milk and will be doing mozzarella soon. I tried to make yogurt from goat’s milk before, but the ultra-pasteurized variety will not work for yogurt. I have used the ultra-pasteurized goat milk in the past. The first time it did not work out, but the other times it did. I found that I had to be very watchful of the temperature. Once it reaches temperature, move it to another burner. One of my readers added heavy cream to the mixture since ultra pasteurized milk can produce drier curds. You can adjust the creaminess by tweaking dripping time. Hope this helps. Great question. I have never used citric acid when making goat cheese.I don’t see why it could not be used though. I would probably do a bit of research before I go ahead and substitute. There are some very good sources out there on cheesemaking. Helip! My milk didn’t curd…? Hi, if you don’t see a curd forming after 5 minutes I would add a little more vinegar. Also be sure to use a digital thermometer to get the temp to exactly 180 degrees. I have had great results with Meyenburg Goat Milk when making this cheese. I hope this help. Let me know. I made this following your recipe exactly and it turned out so good. I’ve tried to make goat cheese before but the recipe I was using used only vinegar. It turned out as others mentioned very crumbly. I believe it is because the milk got too hot. It had huge curds. I’m glad you really stressed that the temperature cannot exceed 180 degrees farenheit. The flavor of the cheese using your recipe was very lemony and creamy. I was so excited to finally have nice spreadable cheese. Thank you so much. I am going to make another batch today. By the way, I have my own Nigerian Goats so I use very fresh milk. Milk from Nigerian Dwarf Goats has a high butterfat content so it makes sweeter milk. Just thought you’d like to know that. Hi! I love fresh goat cheese and our landlords left us some of their fresh goats milk so I am making Za’atar rolled chevre for Thanksgiving. But my question is when my landlords made cheese last they made it with cultures for Chevre and Rennet…is the vinegar and lemon juice just a substitute for these? or are the lemon and vinegar the better way to make Chevre if you want it to be soft and spreadable? Sophie! You are so lucky to have received goat milk. I am so jealous. A long time ago my daughter’s friend gave us some goat milk from her farm. Does it usually come out the same consistency or can one method make the cheese a little softer than the other? We have lemon trees and vinegar already, but im thinking of getting cultures just to try it out. I know it is wonderful! 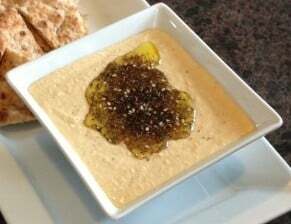 I was inspired by a Za’atar Chevre our friends had the other night from Trader Joes. I think depending on what you use you will obtain a different texture. I’ve only made the soft kind. Let me know how it turns out with the cultures. Followed your instructions exactly. Cheese did to coagulate at all. The only thing that was not exact was the juice from two lemons, which are varying sizes. You should measure the juice and update the recipe. What can I do now with the liquid? Hello Paula! Thanks for reaching out. I will take your advice and measure the lemon quantity, and update the recipe. You do raise a good point. I am so sorry it did not turn out. As far as the liquid is concerned, I am not quite sure what you can do with it. I did find this article which I hope is helpful. Again, thanks for your suggestion regarding the use of lemon. I will work on that this weekend. The salt instruction is at two different places in the recipe. Which one is correct? Is it added with the vinegar, or after it’s drained into the cheesecloth? 4. Add the vinegar, stir briefly until combined and allow it to sit for about 30 minutes. Add salt. 5. The curds will not be large, on the contrary they will be like tiny specks. 6. Slowly ladle into the cheesecloth. Add the salt and stir lightly. Hi Cynthia, thanks for bringing this to my attention. The salt goes in when the curds are in the cheesecloth. My apologies. I LOVE this. Both batches were made with store-bought pasteurized goats milk. Batch 1 was 3%, and batch 2 was 2%. I used half apple cider vinegar with the first batch and half lime juice. Delish, but slightly grainy, powdery, I don’t know how to describe the texture. it wasn’t creamy but still tasted amazing. 2Nd batch, half rice wine vinegar and half lemon juice. I also added a packet of stevia sweetener and lemon zest to the pot just before I poured it into the cheese-cloth. What an INCREDIBLE flavour. but this batch is more fine-grained than the first batch. Neither turned out creamy, but more, almost like wet chalk. The taste is great, but I don’t think everyone would enjoy the texture. Hi Karen, thanks for your detailed explanation. I am glad you enjoyed the flavor of the end result. I am sorry it did not turn out creamy though. I have never experimented with other acidic substances. In any case, I am glad you enjoyed it. Can you double or triple the ingredients to make s larger quantity? I’ve never done that with goat cheese. However, in the recipe card, there is a way to increase the servings and it will automatically increase the ingredient amounts. Ok here is how I do it. 1 gallon Fresh goat milk with the fat content left in it, pour in double bottom stainless steel pot. Heat to 180 degrees or what I do is watch and stir and when the top is solid little tiny bubbles and looks like it will soon come to full boil, but before it does, turn off the burner and quickly add the vinegar. Stir very gently for just a second to stir through the vinegar. Let sit 10 to 15 minutes. I watch for it to look clumpy on top and watery yellow, separated. I use a flour sack towel instead of cheesecloth, either will work fine. Line the collander with the towel and pour the mixture into the towel lined collander, tie the corners, hang to drip for about 20 minutes. Squeeze out just a little more of the liquid. Put the cheese in a bowl and add salt, herbs, etc, what ever you want the flavor to be, or leave plain. To get the consistency I like, I use a potato masher. After mashing to get a creamy consistency, put in a container with a lid. You should have a totally spreadable, delicious cheese!! Thanks for sharing your expertise Cindy. Only once was i able to get fresh goat milk. My daughter had a college classmate with a goat farm. Your method sounds good and very straightforward. I might have to give it a try. Thanks again. I just discovered this recipe. I have made this recipe twice. The first time was fabulous. The second time i fell asleep while the milk was heating in the crockpot! It worked okay. But I will try again and stay awake this time! Thanks for this! Hi Colleen! I am so glad you like this! I Tried it again for the third time. It turned out great! Here’s a couple of things I noticed: first your directions say that the curds are very small and that is sooo true. But I went ahead and strained it anyway and got some wonderful smooth creamy cheese. Second the crockpot takes about two hours for the milk ( I used one quart of Meyerbergs from Whole Foods) to finally reach 180 degrees. This time I was carefully monitoring it after about 90 minutes. The result is fantastic. I thank you so much for sharing this recipe!! Hi Colleen, I am so glad you enjoy the cheese! I like to sprinkle some dried thyme in mine and roll it into a log in plastic wrap after is has chilled a bit. So good!